Farm & Fire is a venture of father and daughter, David and Ada Smith. As a girl, Ada would hang around her dad’s studio, poking her head in to see what new kinds of pots Dad was throwing. Jazz music played and the woodstove was always cranking during the cold days, drying out freshly thrown pots. Ada knew her Dad’s objects were something special. But in rural Wisconsin, the earthiness of David’s Japanese-inspired teabowls, kimchi crocs and sake bottles pushed the envelope as to what “beautiful” objects were supposed to look like in the Western mind. After graduating from college and traveling the world, Ada decided that her creative calling was to share the magic of the Kegonsa Anagama kiln and sprinkle it around the world. With that, Farm & Fire was born. 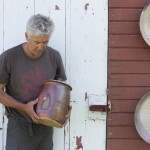 David makes work throughout the year, culminating into one firing every spring for 7 days and 7 nights where family, friends, and students alike keep the Kegonsa Anagama kiln burning around the clock. His work is then sold around the world to those who appreciate the ancient process and product. David lives on the farmstead in Stoughton, Wisconsin. 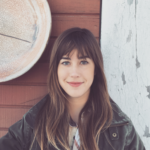 Ada lives in Missoula, Montana where she is pursuing her PhD research focused on food systems that connect and sustain people and places. On this site, we hope to share with you our combined skills & passion for making food and art from the ground up.